Our Magento e-commerce solutions to help your enterprise for better success! Since our foundation in 2011, Magento remains a keystone of our design, development and maintenance services till date. Magento e-commerce development services offered by Stellen Infotech are feature-rich, most notable, modular, scalable and secure and are developed to render highest standards of performance. Using a modular development strategy to offer Magento based projects, Stellen Infotech has an army of experts who have vast experience in the field of Magento development. We, at Stellen Infotech, ensure that each project developed by our developers meet or exceed our client’s expectations and business objectives. With many years of experience and projects under our belt, we have gained an unmatched technical and business expertise. We have been able to successfully serve more than 10,000 clients from different countries. Our huge list of clients belong to different industries including hospitality, manufacturing, construction, logistics, medical, consulting services, online commerce, retail and much more. 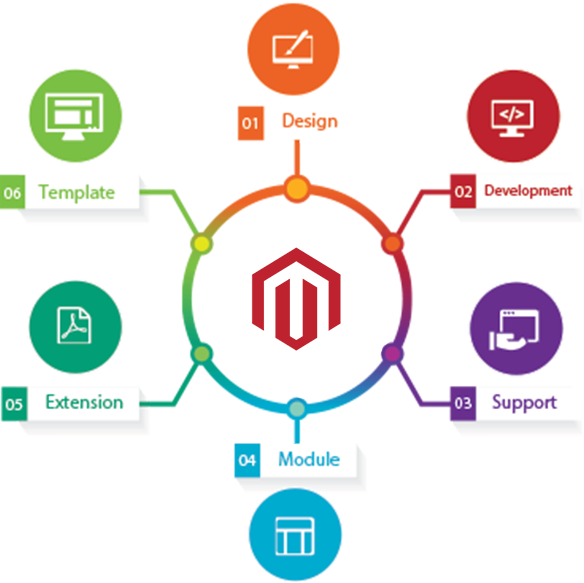 Development of Magento e-commerce solutions involve a well-organized process which starts with crafting a customized solution that is formulated as per the requirements of the businesses and enterprises. Besides offering feature-rich Magento e-commerce solutions, we also ensure that each e-commerce platform has an aesthetically appealing design that makes their customer fall in love with the sites. Magento is a great and powerful platform for building successful e-commerce websites and our developers make the most of this platform to help businesses fulfill their objective. Build successful, secure and robust multi-store with our multi-store e-commerce development services rendered by experienced developers. If you plan on migrating to Drupal from any other CMS, let our Drupal experts do it for you in hassle-free and smooth manner. How our Magento E-commerce development service makes us a trustworthy service provider? We build secure and reliable Magento E-commerce platforms. Our developers keep themselves up-to-date with the latest developments in the Magento E-commerce community to render the right business solutions. Our proficient and fervent team of Magento Developers goes the extra mile to develop stunning user interface, which includes various features such as easy checkout, add to cart, favorites, search option, wish list and so much more. From alluring homepage design and clean product pages to multi-step and easy checkout, e-commerce websites developed by our experts offer your customers an excellent user experience. Magneto e-commerce stores developed by our proficient developers not only look good and render excellent user experience but also enable site owners to update and manage the products, content, pages, picture or other media with ease and convenience.